A generous salesman by the name of Matt at the New England Aston Martin-Lotus dealer volunteered to teach me how to drive a manual. Thanks for making my summer complete! After arriving at the dealer, we took this beautiful white Lotus Elise to a nearby parking lot. Matt pushed the car quite hard to show me how nimble it was -- very! It showcased the car's favorable power-to-weight ratio. 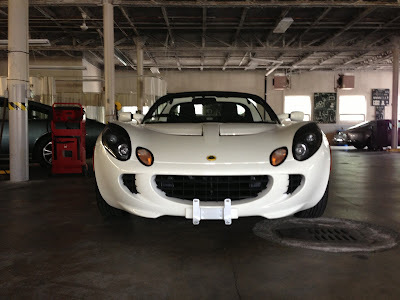 A bit more about the Elise: it's a sub-2000lb roadster powered by a 180hp Toyota engine. 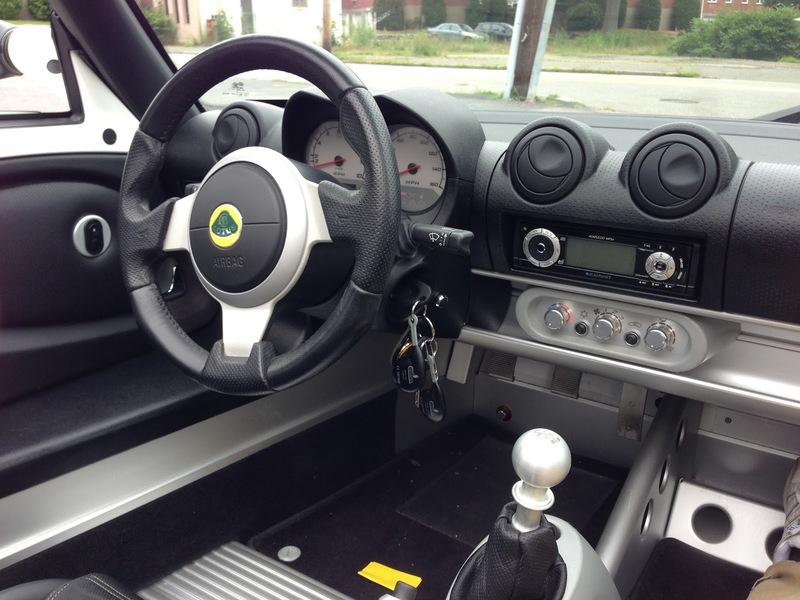 The car is very stripped, whose interior consists of…almost nothing. The mirrors are manually adjusted. The seats don't have a backrest adjustment. The passenger seat is bolted to the chassis. As in, it doesn't move back and forth. And that's why I can't believe this car has power windows. When you shift into gear, you (slowly) let go of the clutch until you feel it grabbing the engine, then give the engine some gas, and finally (slowly) release it. Releasing the clutch too fast, and the engine stalls. Release it too slow, and the clutch wears and may start smelling badly. We started off by starting the car, shifting into first, driving in a large circle, shifting into neutral, and stopping. This took a few tries to get, and even then, I sometimes still had trouble because I was releasing the clutch too quickly after it engaged with the engine. Next up was shifting into 2nd, which was fairly easy. I pushed the car a little harder by going faster (about 20mph) and making tighter turns while doing figure eights. Impressed by how quickly I have progressed, Matt let me shift into third, which went smoothly, although an ominous smell emanated from the clutch. Oops! I then tried starting the car on a 5* hill. The process was more or less the same, but I had to give the car a little more gas to counteract gravity. I took a few tries to get it since I wasn't stepping on the throttle enough. Finally was reverse. I found this the trickiest, mainly because I suffered from some cognitive dissonance -- I illogically thought that reverse was so different from the forward gears. I got it after a few tries, but wasn't as good was shifting into first, etc. As for the ride experience, the car is very loud. The engine drones, since it cruises around 3000-3500rpm; if you've sat in the godawful Smart ForTwo, it's a comparable experience. You feel every single imperfection in the road, and know which tires ran over the bump. An accurate description is a box on wheels, or a street legal go-kart. But it's so undeniably lovable, and I think that makes me sad if I were to turn it down. So here comes the really heartbreaking part: I have to make a choice between the Elise and the 981 Boxster before the end of the year, since the lead time for order a bespoke Porsche is 6 months. (Porsche essentially shuts down the factory to handle all of the special orders at the end of a model year.) I'm not sure if I'll be able to live with the Lotus and its dearth of practicalities, such as next-to-nothing sound deadening, track seats, briefcase-sized trunk, and possibly awkward blind spots. But for now, I'll live and dream as if I had both.